This has to stop, the Mets need a change. ddpayton100 has a firm grasp in the most wins category with a total of 51 with the next Streaker at 48, with only a few matchups to go. I'm sure that $2,500 will put a smile on her face if she can hold on. 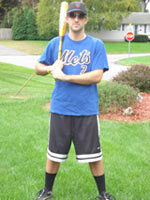 Also, I have taken it upon myself to be the new hope for the New York Mets. As a fan, it has been devastating to watch them falter towards the end of the season for two straight years. Here is my proposal: Sign me, The StreakMaster to a 1-year, 1 dollar contract. I will be the leader, the motivator and of course, Mr.Clutch. I'll be the utility infielder during the 8th and 9th innings, and I don't even have to hit. Omar, just think about it! I mean how worse can it get? Why not bring on a guy with above-average fielding skills and a .624 batting average, in men's softball of course. 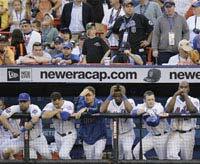 My fellow Mets fans, you know what I'm talking about, we need something...anything! Support the StreakMaster! The new savior of the Mets, The StreakMaster! The make-up game in Chi-town between the White Sox and Tigers has been delayed over two hours now but reports are saying they will get the game in. MLB.com reports that the rain will stop around 6:00 p.m. ET. We will keep you updated as soon as we hear anything more at Streak Headquarters. Unfortunately, today's action is nowhere near yesterday's with only three matchups making our board. Our first matchup of the day features the long awaited make-up game with the Tigers at the White Sox. The White Sox need a win today to keep their playoff hopes alive, but even if they do win there will be a one-game playoff for the AL Central crown on Tuesday. Chicago is favored heavily in this one but the Tigers would love to spoil the party. Our Monday Night Football prop features the total rushing yards of the Ravens and Steelers. Pittsburgh is missing Willie Parker due to injury and Rashard Mendenhall will get the start. I expect Mendenhall to perform well on the big stage even with the trash talking he's supposedly been doing this week. The undefeated Ravens look to stay unbeaten as they take on the Steelers in Pittsburgh. The Steelers are favored by six points at home, but expect the Ravens to come out fired up and try to steal a division win. Expect a hard-hitting defensive battle and the Steelers winning this one by a slim margin. Our former leader went down today at 18 wins thanks to a huge day from Santana Moss. Other Streakers didn't have a great day either, tallying up a 40.7% overall winning PCT, just what the StreakMaster ordered. The top streak breaker were the Eagles losing 24-20 to the Bears and the top streak extender were those impressive Titans, who took care of the Vikings pretty easily. Hope you all had a great weekend! Starting our day once again is the Tour Championship with one matchup between Tim Clark and Ken Duke in the late-morning. In WNBA action, the Shock take on the Liberty on the road at 7:30 p.m., with New York favored by just 1.5 points. On ESPN2 at 8:00 p.m. the 4-0 Connecticut Huskies take on the 2-1 Louisville Cardinals. Surprisingly, the Cardinals are actually favorites, but being at home does have its advantages. Streakers also have another football option in the CFL, with Edmonton on the road taking on Winnipeg who is favored by 2 points. MLB odds for the day: Orioles -110, Astros -115 and Mariners -115. The "Brew Crew" look to use the building momentum to their advantage against their divisional rival, the Chicago Cubs. Milwaukee is favored by -120 and needs to keep on winning to grab the NL wild card. Can Braun and Fielder take the Brewers to the promise land? Turn in to ESPN at 8:05 p.m. to find out. Yesterday's Notes: Another decent day for Streakers overall as you all finished with an 51% overall winning PCT. Out leader did not make a pick yesterday and with the same kind of matchups on the board, I wonder if he will pick today or wait until the weekend. harry4312 still sits on 16. I can't believe USC lost to Oregon State last night! But the worst part is that the Trojans still won our prop since they scored last in the game. Yes, The Streak Master already has fans, even if he's occasionally wrong with his pick. I (The StreakMaster) am chatting with Streakers today at 1:00 p.m. and the main topics today will be college football, what goes into a matchup, will I shave my head when someone gets to 20 and that someone should make me a sign at this week's gameday, just like last week. The million dollar grand prize (for a streak of 25 consecutive picks in a row) often overshadows our monthly leaders. Leading the monthly contest is just as impressive as going for the 25-game win streak. In order to win this part of the game, you have to visit the game multiple times per day and not only pick the games, but get them correct. The leader right now is ddpayton100 with 42 wins this month. Anybody on the leaderboard has a chance to take her down with six days left, so good luck to all. Forty-two wins is impressive and for October, I think I'm going to switch my efforts towards winning the month just to showcase my talent even more. Good luck trying to win next month, Streakers. The Tour Championship tees off today so I decided to put two golf props on the board. First at 11:50 a.m., Chad Campbell goes up against Bubba Watson in our head-to-head "lowest score after nine holes" matchup. Our second golf matchup features Vijay Singh against Camilo Villegas in a nine-hole matchup as well. Campbell and Singh are favored to win their respective pairings but with our nine-hole props, anything can happen. At 9:00 p.m. on ESPN2, David Beckham and the LA Galaxy take on the Chicago Fire. The Fire are favored to win outright at home even with the Galaxy receiving the draw. MLB odds for the day: Cardinals -115, Cubs -112, Twins -145, Dodgers -125, and Giants -111. NCAA Football (USC @ Oregon St.): Which team will be the LAST TO SCORE? The top-ranked Trojans are in Beaver country for the first time since their shocking loss to Oregon State in 2006. USC is favored to win the game by 26 so were wondering, "Which team will be the last to score? With USC expected to blow out Oregon State, I have to give USC the edge to win our prop even though there is a decent chance the Beavers could score last. Streaker's sure know how to get some wins, as proven by the astonishing 68.7% overall winning PCT. Our leader harry4312 has come out of nowhere to take the lead with 16 wins in a row. Streakers did get lucky with the Angels barely getting past the Mariners in a 6-5 ball game. 95% of Streakers who played this matchup received the win and were part of yesterday's top streak extender's club. Monday brings only five matchups for the day, so be careful which one (or two) you choose. Starting the day off are the Florida Marlins who need a win to keep their slim playoff hopes alive in Cincinnati. The Reds are actually favored in this game -105. Our two MLB night games feature Arizona -105 @ St.Louis and Tampa Bay -125 at Baltimore. One of our Monday Night Football props features a total points scored matchup. The over/under is 44.5 so take your guess if the score will be lower or higher. Monday Night Football: Which QB will throw for MORE PASSING YARDS in the game? Two great Quarterbacks face-off in our featured Monday Night Football prop. Brett Favre takes on Philip Rivers in a most passing yards battle. Favre is projected to have 231 to Rivers' 247 according to our fantasy experts. What a day! One of our most action-packed boards of all-time yesterday. Overall winning PCT was 41.4% but there is a Streaker a 16 heading into a tough day today. The biggest streak breaker of the day was Jason Campbell (a StreakMaster pick) who beat Kurt Warner by one yard! Congrats to the fellow 1% who took the 'Skins QB with me. One of the biggest golf event's in the world, the Ryder Cup tees off today at 8:00 a.m. in Kentucky. The Europeans are favored to win day one by a slim margin, but are probably the smart pick here against a Tiger-less USA. The WNBA playoffs continue with Eastern Conference #1 seed Detroit Shock on the road against #4 Indiana Fever, with the road team favored by two points. Five MLB matchups make our board with the odds favoring the Astros -125, Blue Jays -110, Phillies -115, Twins -120 and Rockies -105. NCAAF (Baylor @ Connecticut): How many POINTS WILL BE SCORED in the game? A half-hour down the road in UConn country, the Baylor Bears take on the 12-point favorite Huskies. Vegas has set the over/under at 51.5 therefore we made a prop featuring how many total points will be scored. I have seen UConn play a few times and I don't see the final score being this high nor a blowout, so I'd suggest taking the less then 51 side. Fargonauts' 19 game streak has ended! As they say, "all good things must come to an end", but he did put on quite a show (not to mention a scare at Streak Headquarters). Our new leader sits on top with 16 in a row, only 9 away from a cool million. The StreakMaster also guaranteed a Colorado win, but Streakers overwhelmingly chose West Virginia which destroyed even more streaks. The overall win PCT was another low 34.5%. 2:48 PM ET: Streak Leader Speaks, StreakMaster Doesn't Have Fans? "I am a HUGE sports fan and I tend to follow college sports more regularly. My favorite team is the Iowa Hawkeyes since I received my bachelors and MBA degrees from there. I am a life long fan and have had football and basketball season tickets for many years. As I get closer to #25, I am starting to feel more and more pressure which I feel is a good thing. However, last night was excruciating as the game was in doubt until the final pitch. The reality is that we are talking about a potentially life changing amount of money. However, I certainly have to keep things in perspective and reminding myself that the goal is still a ways off. Until I get to #20, I can't really worry about #25 and what that may bring with it. It's a lot of fun and it is definitely exciting and I hope to continue as long as possible." It seems like Fargonauts has a good head on his shoulders although, I don't think he is "feeling good" about the pressure as he moves closer to the magic number. I mean if you were 6 picks away from 1 million dollars, wouldn't you be a going over every possible stat for every matchup on the board while pacing back and forth in your office for hours? I know for a fact he is more nervous then Sergio Garcia on every 18th hole. Oh, and another thing. 3 fans of the StreakMaster on Facebook? Really? Where are my fans? Is there anyone out there? Throw me a bone here! Today marks the second day of group play in the UEFA Champions League. At 2:30 p.m. Manchester United takes on Villarreal at Old Trafford in what should be Cristiano Ronlado's first match of the season even though he is projected to come off the bench. Man U is favored by a good amount so we decided to provide a goals prop. The over/under made by Vegas in 2.5 total goals, therefore each side is split 50/50 in our matchup. Another fan favorite, Arsenal hits the pitch at 2:30 on the road against Dynamo Kiev. Arsenal is favored to win outright on the road but only by a slim margin. The final regular season meeting between the Rays and Red Sox takes place tonight at the Trop. The Rays are favored to win with the line at -128, and with first place on the line again, tempers could fly. Other MLB lines: Mets -118, Cubs -119 and Rangers -134. The Wildcats head to Cardinal country trying to keep their undefeated record intact. Kansas State is favored to win the game by 4 and I am surprised it is not by more. Louisville is at home but the Big 12 is very strong this year and I'd take Kansas State in this one. Wow, what a game last night! The Phillies and Braves had a instant classic, which came down to Atlanta's final at-bat. The Braves had the bases loaded with two outs but failed to get a run home, which gave Philly and our leader the win. Fargonauts is now at 19 wins in a row, and if I was nervous during this game I can only imagine how he was. The overall winning PCT was a decent 54.1%. Our 5:00 p.m. matchup has been taken off the board because of the game starting at 2:45 p.m. The game is broadcasted at 5:00 p.m. on ESPN Classic but because of the tape delay this matchup has been deleted. We apologize for the inconvenience but all picks are now unlocked if you picked this matchup. The UEFA Champions League group stage has begun! Be ready for some great matchups on soccer's biggest stage, as they will make it to our board on a regular basis. At 2:30 p.m. last year's runner-up Chelsea takes on Bordeaux but with Chelsea being the heavy favorite in the game we threw out a "fewest yellow cards" prop to make the matchup a toss-up. Some great MLB matchups finish out our night with odds favoring New York (AL) -135, Philadelphia -127, Cincinnati -123, Texas -133 and Kansas City -108. C.C. Sebathia tries to stop the bleeding for the Brew Crew as they take on the NL Central leading Cubs. Will the firing of Ned Yost help or hurt the Brewers and their run to the postseason? Milwaukee is favored in the game with C.C. on the hill but don't sleep on Dempster and the Cubs at home. Looks like Streakers got the best of the StreakMaster today with a 67.5% overall winning PCT. Mutiple double-digit entries our on the leaderboard and leading the charge is Fargonauts with 18 straight wins. Can you imagine? Someone is only 7 wins away from 1 million dollars! Welcome to another Monday, Streakers. While you were laying tracks down with MC Hammer last night, I added some more matchups to the board for today. In the English Premier League, Tottenham looks for their first victory of the season when they host Aston Villa at 3:00 p.m. Aston Villa gets the edge with the draw, but not by much. The Red Sox looks to pull within a tie of first place in the A.L. East on the road at Tampa where Dice-K takes the hill against Scott Kazmir. The Rays are limping down the stretch but are favored to win game one of this three-game set. Tonight, our big Monday Night Football prop features two of the leagues best QB's as Tony Romo (with Jessica Simpson in attendance) takes on Donovan McNabb to see who will get more passing yards. MLB lines for the day: Cubs -120, Twins -118, Yankees -122, Rays -116 and Rangers -134. MNF: Which team will have a HIGHER TOTAL after the adjusted points? The Cowboys host NFC division rival Eagles tonight in a big game for both teams. Both Quarterbacks are coming off stellar performances last week and look to stay on top of the division. "America's Team" is favored by 7 so we gave the Eagles 7 points to work with in our prop. The game should come down to the wire, therefore I give the Eagles the slight advantage with the adjusted points. Yesterday's Notes: Another +.500 day for Streakers finishing the night off with a 51.4% overall winning PCT. The Steelers top receivers took care of the Browns to earn the top streak extending matchup while the Saints loss to the Redskins was the top streak breaker. Our current leader has a two game cushion with 16 wins in a row but the lead could be in jeopardy with a tough day of picks coming up. The world's most popular soccer club, Manchester United, takes the field early Saturday morning at 7:45 a.m. Man U is at Liverpool, who has a great squad of their own and plays well in front of their home fans. At noon, Navy (1-1) takes on Duke (1-1) in Durham and surprisingly, Duke is favored by two. Duke could be above .500 for the first time after three weeks of the season with a win, but I can't see that happening. Also at noon, we have matchups on both ESPN and ESPN2: Cal is on the road at Maryland and Michigan State hosts Florida Atlantic. Both Cal and MSU are favored, -15 and -17, respectively. The can't miss matchup is at 3:43 p.m. (weird time, no?) on NBC when Michigan (1-1) takes on Notre Dame (1-0) in South Bend. Michigan is favored by 2.5 and I see this game being a 10-7 win in favor of the Wolverines. Lastly, there is a great "higher total" prop at 7:45 p.m. The Washington Huskies try to bounce back from their 0-2 start (due to a horrific call by the way) when they host No. 3 Oklahoma on ESPN. Washington's total points scored are matched up against the winning margin of the Sooners, who are favored by 21 points. Of course it has to be the Clash at the Coliseum! USC is (and should be) favored by 10 points against Ohio State. The game's outcome undoubtedly depends on if "Beanie" Wells will play. If he doesn't play, I don't think the Buckeyes stand a chance. It should be a highly entertaining game when these two talented teams take the field, but I give the edge to USC, even if Wells is in action. Yesterday's Notes: Friday ends with a overall winning PCT of a decent 54.1%. We also have a new leader, JRStrong who sits at 16, and is now only 9 away from the million dollar grand prize. Welcome to a soccer and baseball filled Wednesday. Kicking off our day is the World Cup Qualifying (European Division) featuring Greece at Latvia. Both teams won their opener and although Greece seems like the obvious pick, don' underestimate Latvia at home. The Yanks try to make best out of the last few weeks of their 2008 season on the road against the Angels. With Pettitte on the hill, New York is favored at -108. Seattle, Baltimore, Toronto, and St. Louis are all favored as well. World Cup Qualifying: Which team will record FEWER YELLOW CARDS? With the U.S. favored to beat Trinidad & Tobago, we had to put our great sports minds to the test here at Streak Headquarters to come up with a prop for this match airing on ESPN2. Both teams have been getting a little frustrated with the referees in their past few games, so we decided to see which team will receive fewer yellow cards. Both squads had 3 in their last qualifying match, therefore it makes this matchup a toss-up. Yesterday's Results: INSTANT STREAK CLASSIC!!! The Monarchs win in the closing seconds against the Storm in a spectacular WNBA matchup late last night, with the final score: 77-74. Both leaders whom reached 15 earlier in the day saw their streak come to an end thanks to the Storm loss. Seattle was the days top streak breaker, with 93.8% of entries taken them in this matchup. The overall win PCT finally came down to 39.8%, just where the StreakMaster likes it. Norway's U-21 team just took down Scotland at home, 1-0. With that victory, Tacaws has moved into a first-place tie with co-leaders: travtheman87 and JHill34. For all those that have been wondering, JHill34 is not ESPN.com columnist Jemele Hill. Our Insider's version of the Streak winner has the all-time record of 15 consecutive wins, but that record is in serious jeopardy. Also, last Thursday during The StreakMaster chat, an idea was suggested that I shave my head bald if a streak hit 15. Although I refuse to shave off my newly frosted tips, I am now taking suggestions on my new Facebook page on what to do if someone reaches 20 wins in a row. Be sure to listen to Thursday's Fantasy Focus Podcast when Nate Ravitz and Matthew Berry bring me, The StreakMaster on the show to talk Streak, all things fantasy and of course, 90210. Last night after the Vikings and the Packers game on ESPN, the next matchups on our board (Denver vs. Oakland and longest TD play) became locked while we tried to extend the matchups for Streakers to pick. Unfortunately, we ran into some technical difficulties and were not able to unlock them. We are working on this issue so it will not occur in the future. Keep streaking everybody! The U-21 Euro Championship makes its debut on our board with Scotland on the road in Denmark. Scotland is favored in the match with the draw but just by a few percentage points. In the evening, the Rockies try to continue their playoff push in Atlanta, but with time running out they need a win today to stay alive. The Braves are favored -117 going up against Colorado's ace Aaron Cook. The Cubbies try to stay on top of the NL Central as they take on their arch-rivals in St. Louis. The Cubbies get the edge at -117 as well but don't sleep on the Cards. The WNBA finishes off our night with the Seattle Storm on the road against the Sacramento Monarchs. The Sue Bird led Storm are underdogs and rightfully so, by 4.5 points but I'd take the Storm here. Pitchers Duel in Boston: Rays @ Sox: Which Ace will have MORE STRIKEOUTS? Two stud pitchers take the hill in this very important game at Fenway Park. In this strikeout matchup, they seem to be dead even with 33 strikeouts a piece in their last 5 starts. But with the Sox at home, Dice-K gets our pick at Streak Headquarters. Yesterday's Results: You guys can't be taken down! 61.1% overall winning PCT, another day over 60? Wow, I'm not sure if these matchups are too easy or you all are on a hot streak, I am hoping for the latter. Anyway, the top streak breaker of the day were the Minnesota Vikings whom 65% of users picked in that matchup (should have listened to the StreakMaster) but the Broncos saved the day with their pounding over the Raiders 41-14, earning them the top streak extender of the night. Two leaders have reached 14, but entries with 13 are breathing down their neck...Can they all hang on? The Women's semifinals of the U.S. Open starts us off today with a straight up win matchup. Our Vegas book as Elena Dementieva as the -163 favorite though early returns show most picks going Jankovic's way. The second semi features Serena vs. Dinara Safina with the prop matching up Games Won vs. Aces + Double Faults. No Vegas lines here on paper it appears pretty even. Here's Serena's stats in her previous five U.S. Open matches (Games Lost/ACE+DF) = 12/12 vs Venus, 4/4, 5/3, 9/2, 6/5. The evening offers four MLB games, all with playoff implications, featuring the ESPN late night game - Arizona (Haren) vs. LA Dodgers (Lowe). NCAA Football (Navy @ Ball St.): Which side will record a HIGHER TOTAL? Last 5 games: Navy Rushing Attempts: 58, 58, 61, 60, 57. Vegas game Over/Under = 59. This one is a coin toss. Good luck!